Occurance: Zincite (ZnO), Zinc blende (ZnS), Calamine, Zinc Carbonate (ZNCO3) etc. The big lumps of ore is first crushed by a jaw crusher and powered in ball mills. The crushed and pulverized ore is concentrated by froth flotation process. This process is used for the concentration of sulphide ore. The powered ore is suspended in water and after adding pine one, it is stirred by passing the compressed air. The particles of the sulphide ore which are wetted by the oil comes to the surface along the froth (fizzy substance) which is taken out and the gangue particles remains at the bottom which are then removed. The concentrated ore is roasted in the excess of air at a temperature of 900 degree celsius in the reverbatory furnace. In this roasting process, the volatile impurities are also removed as their oxides. It is one of the most important, continuous and commercial technique for the reduction of zinc. Here, zinc ore is mixed with the coke in the ratio of 2:1. It is passed through the charging door. The retort is heated by the producer gas (CO + N2 ). 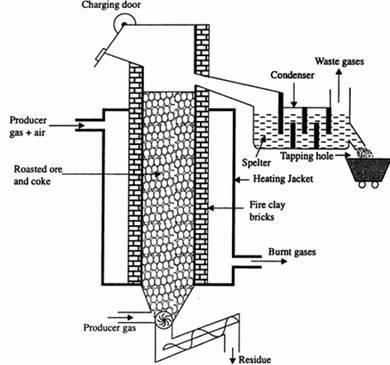 Zinc vapour along with the carbon monoxide is led to the condenser by applying a suction and forcing producer gas from below. Following reaction takes place during reduction. Molten Zinc is taken out from the condenser time to time. The crude metal obtained is called zinc spelter which contains about 3% of other impurities. e. Purification: The spelter zinc contains Fe, Pb, As, Sb, Cd as impurities. It is further purified by electrolysis process. I like the diagrammatic illustration of the purification of Zn , it’s quite explicit. Pls shine more light on how the slag is formed and how Zn vapour is separated from carbon monoxide. Thank you. Thanx a lot. tThe explanation is so clear that no one can get confused. Thank u so much.it is very clear explained that no one can get confused……………………..